JaimeBlogers: I am feeling very much alive! 42goals.com is awesome and really helped me to focus on the task at hand! 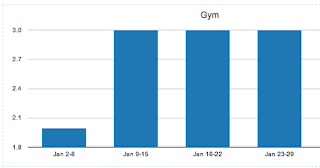 I am a visual person and logging my data every morning and seeing the results was thrilling! 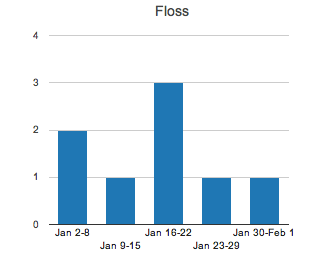 As you can see, I made my flossing goal one week out of the month, but gave it a valiant effort. And just because it's February doesn't mean I am going to stop. As for the gym...booya! (Weird scale on that graph, dontchathink?) Speaking of the gym and my last post about going to Pop Physique with Helya (a type of Barre fitness class), well I saw on Facebook TODAY that my new Leadership SLO (yes, that's another story) friend went to a BarreFit class in SLO. Well, I had no idea that even existed here! So she gave me the scoop and I am going with her on Monday after work to try it out! Whoo!! I tried really hard to consciously think about my 13 Personal Commandments over the course of the month. I often found myself literally pausing over decisions, thoughts, or conversations about who I really am, what I stand for, and what is important to me. During the past month, I concentrated on 'Do it NOW', 'Be Patient', and 'Be Bold'. And guess what? I did all of those things! The 1-minute rule is officially in full effect in the Dwight Household. We are constantly tidying things up and putting things where they belong. It seems obvious, but just the conscious thought of, "oh it takes 30 seconds, just do it" is a huge motivator! I have surprised myself this month with the amount of patience I've shown over our bathroom remodel. Steve has knocked out ALL of the tiles, taken out the old drywall, and now there are just lonely 2 x 4's. I can see the progress and I can tell Steve is thoughtfully planning out the next step, so I am patient. I AM PATIENT! Plus, I tackled a nagging task and cleaned out the master shower and wow it's heaven in there!!! My boldness surfaced a few times this month too. Again, to my surprise and satisfaction! I went on a three day retreat to Wonder Valley (east of Fresno) with a group of 40 strangers for a program I was accepted into called Leadership SLO. The retreat was just the orientation to the program which lasts most of 2012. None of us knew each other and we were thrown into this "summer camp" sort of situation where I had roomies, played name games, experienced my first trust fall, and managed to get across the hot lava! The whole experience was scary, intimidating, refreshing, and exciting. I met amazing new people who I can already call friends and I can tell that this year is going to open my eyes to the nooks and crannies (and people!) that I didn't know existed in SLO County. 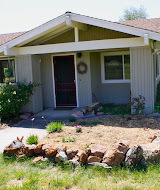 Now, if you look ahead a bit to my March goals, you will notice that the focus is on work. Well, either I am psychic or just really want to be the Valedictorian of Happiness Projects, but that little 'Aim Higher' bullet has already come to fruition. While I was busy being bold and being Jaime, I was called into my boss's office and was invited to step in as the new Human Resources Manager at work! I happily accepted and starting March 1, I will be taking on HR duties in addition to my current EH&S work. I am over-the-moon, honored and flattered that they think I am a good fit for this position. It actually made me stop for a moment and realize that maybe, just maybe, people don't see me as a small wimp, as a pushover, as a nervous nancy. Maybe I am none of those things afterall! Maybe I am great! Anyway, I am having a ton of fun with this little project and sharing my progress and I LOVE hearing from you! Heather, thank you for the comment on my Happiness Page and I love your own Secrets of Adulthood :) And, Maren, thank you for taking interest! Really, I was sort of caught off guard when you mentioned my project at the bonfire because really I don't know who all reads this stuff, so thank you thank you thank you for asking me about it and letting me tell you. :) Means a lot! Cheers to February, the month of Luuurve...oh and tax prep!